I also used the phone to watch a couple of episodes of my favorite TV series The Newsroom, Person of Interest, Forever and The Flash and found the experience even better than watching these shows on the G3, primarily because of the larger screen and the more responsive performance of the Mate 7. The phone saves up to 50 percent of battery life by using smaller A7 cores to run standard apps, which the company said consumers use “at least 80% of the time.” The phone uses the bigger A15 processors for high-demand use such as in gaming. That explains why the phone was such a joy to use when I tried out a few games in it. The Mate7 has a 4100 mAh non-user removable lithium polymer battery – a beast considering its svelte frame. I got the device about half-way charged on a Monday and it still had power even by Wednesday night, after more than a day of heavy use taking photos – often trying its rapid-fire multiple shots capability by pressing continuously on the shutter button – watching TV shows, listening to music and podcasts and trying out a few games. I gave it a full charge Wednesday night and used the phone for reading, checking emails and keeping up with news on Thursday and then doing a factory reset on Friday before returning the device and it still had more than 85 percent battery charge. Like I said, a beast. The phone comes with Huawei’s EMUI or Emotion UI and it looks good. I’ve long used Nova Launcher and when I tried EMUI for the first time with the Mate 7, I found it visually refreshing and actually liked the experience of using that interface with the phone. I tried out a few of its themes and the selection was good. The phone comes with Android 4.4 or Kitkat, the penultimate version as of this year. “It enables users to unlock the phone at least 80 percent faster than devices that use a slower sweeping recognition option,” Huawei said in its website. I tried it on the test unit and it does live up to the company’s promise. The phone took only one touch to unlock the device using my fingerprint – a pretty nifty feature that saves you a lot of time (multiply the time it takes to enter your PIN by the number of times you check your phone in a day and you’d get a peek into how much time the system saves for you – time you can then on the latest viral mobile game). THIN FRAME. The Mate7 is just 7.9mm thin and looks very sleek. The Mate7 comes with a 13-megapixel camera with autofocus and LED flash. It’s front camera is 5 megapixels. I used it to take a few test photos and liked the results, especially those taken in low light condition. It’s at par with my favorite cameraphone, the LG G3. The phone can do 1080p video recording and playback. The phone comes with 16GB built-in memory that is expandable through a microSD card up to 128GB. 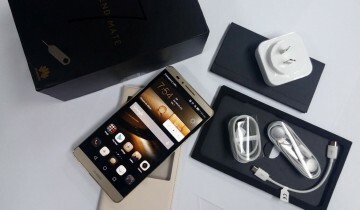 The company says the Ascend Mate7 uses a “dual antenna optimized to provide fewer dropped calls and smooth 4G LTE navigation.” It said the the device is compatible “with a wide range of network spectrums worldwide . . . and uses smart antenna switching to intelligently detect the strongest signal, choosing the ideal source for emission or reception of data.” The company said the device uses Cat6 4G LTE technology with a download rate of up to 300 Mbps within a compatible network. The test unit I used was the amber gold model and it looked really good. The package comes with a good quality folio case. The Huawei Mate7 retails for P27,890 in regular phone stores and in retailers like Thinking Tools, which lent the unit used for this review. For its price, the Huawei Ascend Mate7 is a great phablet that should be on top of your list if you’re planning to upgrade your phone this year. TEST PHOTO. A test photo taken with the Huawei Mate7 of the wooden robot on top of my computer in the Sun.Star Cebu central newsroom. Click on the photo to view the full size. I did not edit the photo and merely compressed it to save on file size using the TinyJPG service.